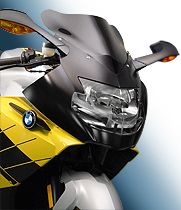 ZTechnik® makes a wide variety of replacement and accessory windscreens for the older generation of R-Series, K-Series and F-Series BMW® Motorcycles. Some are replacements for OEM screens, while others are optional accessories for bikes that did not come stock with a windscreen. 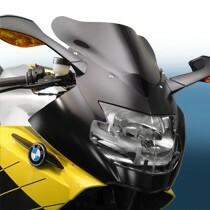 Click the "SHOP" menu to find your model BMW motorcycle and see the options that are available. 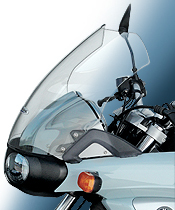 You can count on ZTechnik® WIndscreens to be a valuable addition to your bike, whether you're looking to replace your OEM screen with something shorter and sportier, or with a windscreen that's taller for better wind protection. 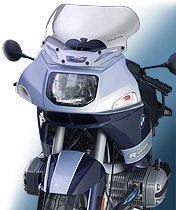 All ZTechnik Windscreens are designed directly on each model bike, so you're guaranteed a perfect and exact fit as well as better performance and enhanced appearance. All ZTechnik Windscreens are made from hardcoated polycarbonate for unbeatable strength and scratch resistance. ZTechnik® Windscreens are made from 4.0mm-4.5mm thick polycarbonate and feature either FMR hardcoating or our exclusive Quantum™ hardcoating for the most scratch resistant windscreen in the world. Each ZTechnik Windscreen is precision cut and drilled on our CAD-CAM equipment and will have computer-routed, smooth radiused edges. They are then three-dimensionally thermoformed for a sculpted look that's a perfect complement for your bike. All ZTechnik® Windscreens are made from thick, durable polycarbonate with our exclusive Quantum® hardcoating or FMR hardcoating. These are the best quality windscreens you can get, with excellent optical clarity, unbeatable strength and unsurpassed scratch resistance. Our windscreens are dimensionally molded rather than flat formed for peak performance and a perfect, customized fit. All edges are routed and mount holes are precision drilled. You won't find a better windscreen than this! All ZTechnik polycarbonate windscreens are covered by our 3-Year Warranty against breakage!